When we first looked at the possibility of closing crawlspaces, I was sure that going to be a bad idea. Based on all of our training and experience up to then the best way to control moisture was to install aground cover of 70 – 80 percent of the ground space and introduce more air so we the industry started installing more vents, introducing Temp -Vents Automatic Vents System and Power Vents became common. That worked until we go into the 1990. As home owners reacted to the need to save energy tighter construction became the thing in most all structures. More insulation, better sealed walls, windows and doors. The tighter the house go the more the crawlspace became a bigger problem leading to huge moisture problems, fungus, mold, mildew, insects, foul odors, and structure damages. Crawlspace remediation became the best solution for dealing with these problems, but only if done properly so over the last ten years we have experienced lots of situation that has led to some improvements in the process that we now know must be considered. First we need to look at what are the requirements to prevent excess moisture that leads to higher than wanted relative humidity. Moisture below 20 percent inside the structural timbers in crawlspace and humidity below 60 percent will not form mold are rot due to decay fungus. Best setting need to be lower year round so between 10 and 20 moisture and 40 and 60 humidity is in the safe range. Due to today’s tight construction some type of dehumidification is recommended in all areas. Some of the newer whole house air-conditioning units offers built in deification as a part of the unit providing the unit is large enough to include the volume of the crawlspace. Closed crawlspace can also cause a problem when ground water comes in the crawlspace or some leak accurses allowing water to collect on top of the ground cover. Without some way to dissipate the excess water enactive fungal spores with germinate and the problem starts all over without proper provisions with dealing with the excess water. That simply is why it is recommended to install a dehumidifier in every closed remediated crawlspace and a water alert system available through your supplier. Next is ground cover, there are many types and manufactures out there that make excellent ground covers. 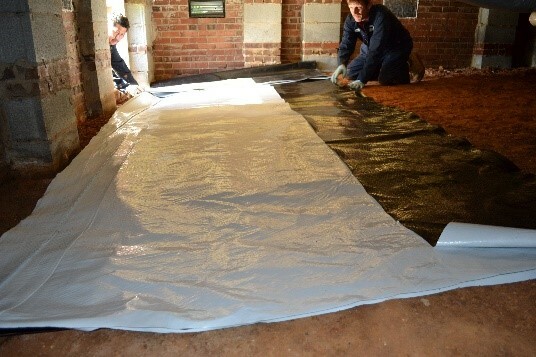 Ground cover is not just a piece of polyethylene you want it to do the job and improve the appearance of the crawlspace. The objective is not just to cover, but is to seal the space at 100 percent so rising humidity does not come inside the space. The thicker the ground cover is the better, current the millage runs from 6 mil, all the way up to 24mil. With 8 to 12 reinforced being the most used. Colors all the way from clear to white and with and without liners to go under the cover. Joints have to be sealed with at least one foot of lap, two foot is recommended. Seal can be adhesive sprays or best double sided four inch tape. Pears also need to be covered and sealed in the same manor. Regardless of foundation wall type brick, block, rock, or poured concrete they need to be sealed. Leaving an inspection area of four inches at top and bottom of the wall for termite and other inspections. Vents, opening around utilities entries and foundation cracks. The smallest opening will allow outside hot air to find it a way into the crawl space bringing water with it seeking cooler surfaces referred to as perk point. The next point to consider is insulating inside of outside foundation walls with Foam Insulation Board. Now several manufacturers and distributors have a product that is treated with borates for the control of insects and installed correctly has shown not to increase the accordance of subterranean termites. Check with your crawlspace supplier for a list of the new products. Wood treatment is a vital part of the crawlspace remediation program. Mold spores should not be left on the substructure they will go dormant when the moisture is reduced, but as soon as the moisture returns for any reason to 20 plus percent the spores will reactivate as they were before the remediation. After cleaning the wood needs to be treated with a fungicide and water repellent to control any existing fungus and prevent it in the future. Follow up inspection is needed to verify the space is dry and the humidity and moisture are at expected levels. 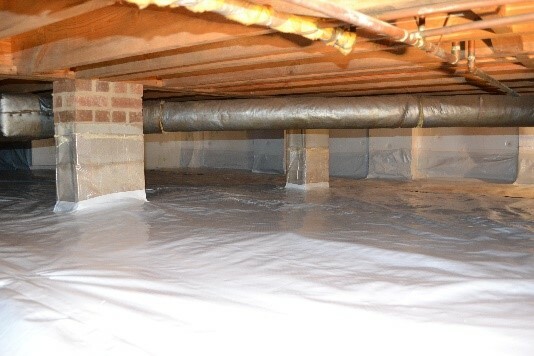 Remediation of the crawlspace saves energy and improves the quality of the whole structure.